Aquarius is prone to the influence of Uranus, and Cancer absorbs shimmering moonlight. Both signs are rather changeable. Aquarius changes course suddenly and, therefore, is more unpredictable, while Cancer’s moods rarely acquire clear outlines, but flow from one another. The main difference between Aquarius and Cancer is that Aquarius is able to abstract from itself. He can retreat and view the perspective from a rational point of view. And Cancer is in the middle of the problem and lets it through. For Aquarius, understanding the exceptional sensitivity of Cancer is a significant problem. Aquarius can very simply explain everything literally, to predict what feelings he will experience in this or that situation. Consequently, the closeness of the child who lives and breathes feelings, puzzles him. It seems that this child has appeared from another planet - and it’s true! If Aquarius pays attention to the phase change of the Moon, he will make some idea of ​​the rhythmic, cyclic phases that push Cancer to inner thinking and outward manifestations. Aquarians like to learn the unknown, and what can be more exciting than watching how the moon’s disc in the sky melts, disappears, and then lights up the whole sky again? Sociable Mom Aquarius must have re-acquainted her little Cancer with all her friends. She does everything in her power to widen the horizon of the child, gradually instilling in him a public consciousness, and this is so useful for Cancer! Just do not forget that Cancer in his or her soul is a very domestic child. He is not one of those who grow up quickly, and he should not be rushed to do this. Well, Aquarius can believe that her child is too affectionate and ready to hide behind her mother’s skirt when she sees strangers. Cancer really needs help from the mother before it adapts to something new, but give it time to get comfortable. 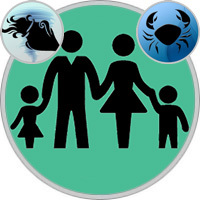 Mom-Aquarius likes the sensitivity, intuition and care that manifests in her little Cancer. But she will have to do a lot for her part, so that her child will get that Heart Love that he needs. Aquarians have logical and rational thinking, so this mother will be happy to deal with social problems or think about how to change the world for the better. And she does not want her good impulses to depend on children’s whims. However, Cancer lives primarily feelings. They paint all of his actions, and he needs strong emotional ties like air. Mother Aquarius should understand the nature of her child, show him her affection, play with him, listen to him and thereby help him feel completely safe. The mother must remember that this child needs a regime, even if it is not proper for her. And it is possible that she will be somewhere in the next meeting, when the time will come to give the child a familiar apple… Aquarius mom should not consider her small Cancer as an egoist if he does not show interest in her public affairs. Just to each his own: the circle of mother’s interests expands to the universal scale, but Cancer is more interested in the cozy world of their home, caring about their toys, about the cat and about the mother. Aquarius is able to give children great opportunities for natural development, without imposing too much on them. Just do not forget that a small Cancer every day need to talk about being loved. Not like the other Aquarius father, it seems to little Cancer the person of complete surprises. Then he suddenly plans to travel, it seems to be a clown - and the child does not know what will happen next time! And although Aquarius seems so cheerful, he can be in a bad mood and look at everyone with a detached gaze as often as Cancer. In fact, they have a lot in common. Both the one and the other have a very caring character, except that the father is always worried about others, and his child wants to take care of him! True, a small Cancer considers his father reasonable and fair and accepts the rules that his father will necessarily explain to him. And if the child understands why it is necessary to behave this way, and not otherwise, he will do everything as it should. Sometimes the Cancer becomes capricious, and it irritates the father. He would like his child not to have problems with communication, as they do not have himself, and he is worried that the little Cancer is too prickly and too emotional. And it would be nice that he would look more broadly at things and learn how to question the decisions of others where one can think and draw conclusions himself. But Cancer does not hurry to independence, because the house is much calmer. One day he will learn to look at life in a fatherly way, but do not hurry with it. Father-Aquarius often looks much more modern than his child-Cancer: Cancers prefer what has already been tried and tested by time, but Aquarians are innovators who are worried about any new ideas. Sometimes his father is so carried away by his own world that he is not up to the child with his interests. This is a very troubling little Cancer, although he himself feels a similar need, closing himself from everyone in his room. But he needs to know that the father will necessarily be there, if necessary. It would be better for everyone if the attachment of the father to the child became more obvious, because this would give Cancer confidence that he loved, that he was completely safe, and would not allow him to feel rejected when his father is busy with himself. Aquarius expands the horizons of Cancer, and this is helped not only by books, but also by conversations, because the father is very interesting in explaining everything that happens in the world. And it will be even better if he begins to connect certain issues with certain feelings. Is it possible to forget that the world of Cancer is full of emotions? So, we need to find such a way of communication, in which the necessary information would be received not only by the mind, but also by the soul.